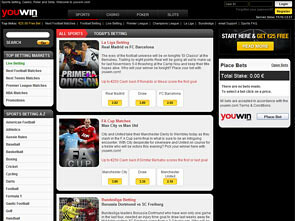 YouWin is an online sportsbook that was founded in 2005. Enjoy high quality design that invites you into the exciting world of sports where online betting helps you to make profits and make every match or set even more thrilling to watch. You can choose among such sports events as football, baseball, golf, motorsports, basketball, American football, tennis, volleyball, ice hockey, billiards, handball, cricket and some others. 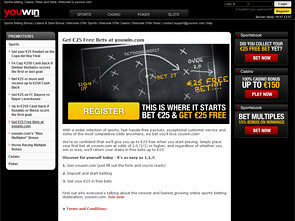 Take advantage of various bonuses available depending on the sports event you want to bet on. YouWin sports offers you to get 100% up to $25 for your first deposit made. All you need is to register an account with YouWin and make your first deposit to place first bet at odds of 2.0 or higher and get up to $25 free. Even if you place your first bet at odds below 2.0 (1/1), you can place the next bet at 2.0 or higher and qualify for this promotion. In order to withdraw the winnings from free bets, you must first wager an amount of five times the winnings. The following countries are not eligible for the free bet offer: Belarus, Bulgaria, Latvia, Lithuania, Portugal, Romania, Russia, Serbia and Ukraine. To register an account takes little time. 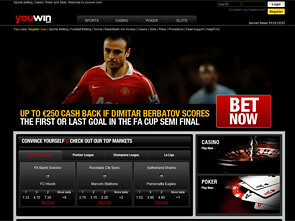 Now you can deposit easily, get your bonus as well as to manage your betting odds easily. There are no video tutorials or sports news section. Just betting lines to choose from and place your bet. There is only English language to choose from that is not advantageous for players from other countries. However, you can enjoy live betting as well as to find out more about the basic strategies and tips to make profits on online betting. You can deposit with Bank Wire, Moneybookers/Skrill, MasterCard, Neteller. Just register an account and make your first deposit to start betting online. There are different terms and conditions concerning the time to process your withdrawal depending on the payment method you choose. The longest way to get your money is to use Bank Wire (up to 7 days). Ewallets presented require from 2 to 5 business days to process money transaction. You can email at YouWin with all the queries you are interested in. You also have FAQ section with basic questions answered and basic betting rules and terminology explained. 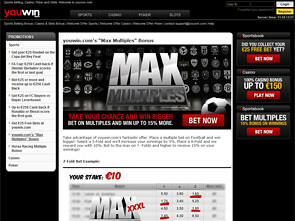 Feel free to ask questions about payment options, deposits and withdrawals as well as betting odds and promotions.